It’s not exactly difficult to find high-quality meat these days. 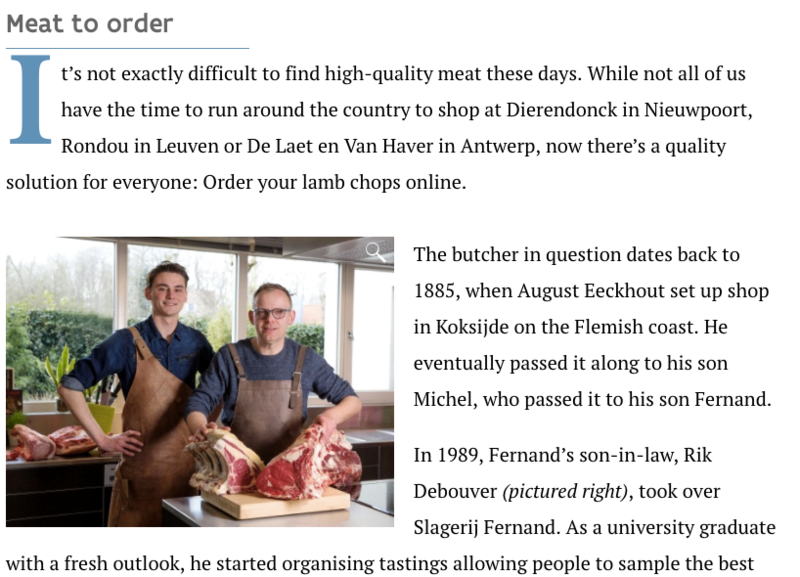 While not all of us have the time to run around the country to shop at Dierendonck in Nieuwpoort, Rondou in Leuven or De Laet en Van Haver in Antwerp, now there’s a quality solution for everyone: Order your lamb chops online. The butcher in question dates back to 1885, when August Eeckhout set up shop in Koksijde on the Flemish coast. He eventually passed it along to his son Michel, who passed it to his son Fernand. In 1989, Fernand’s son-in-law, Rik Debouver (pictured right), took over Slagerij Fernand. As a university graduate with a fresh outlook, he started organising tastings allowing people to sample the best the world has to offer – pata negra iberico, simmental, rubia gallega and dry-aged pork belly. Rik’s son Jef (pictured left) was also looking to discover new things. At 20, he set out to explore the world and ended up at a cattle ranch in Australia, where he worked as a cowboy, discovering the potential of free-range meat. Last year, he brought his ideas back to Koksijde, and the Gustor Meat Boutique was born. It’s one of Belgium’s few online butcher shops, and its range includes Black Angus, Holstein Premium Austria, 100% Wagyu and much more. The meat is cut and prepared in the shop and is delivered refrigerated within 24 hours to anywhere in Belgium France, the Netherlands, Luxembourg and Germany. The meat selection is posted in three languages and includes lamb, pork, beef, game and poultry. Currently, you can get organic lamb chops from the Ardennes and grain-fed Black Angus beef from Australia. And should you want to visit in person, Slagerij Fernand is at Zeelaan 308.